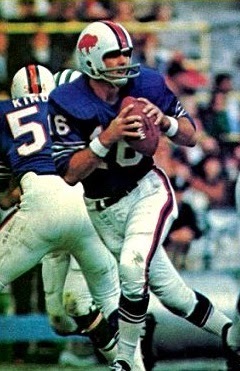 A product of Head Coach Don Coryell’s program at San Diego State, Shaw threw 39 TD passes in 1969, including 9 in a single game, and the team was undefeated during his starts. He was chosen by the Bills in the second round of the 1970 NFL draft and took over the starting job from Dan Darragh three weeks into the season. While possessing a strong arm, toughness, and plenty of confidence, Shaw also had difficulty reading defenses, lacked consistency, and failed to build upon his promising rookie season. He led the NFL in interceptions (26) in 1971 while his overall production dropped, and after a slightly better year in ’72, a knee injury caused him to lose the starting job to rookie Joe Ferguson in 1973. Shaw was traded to the Cardinals for 1974, reuniting him with Coach Coryell, but he saw little action as a backup over two seasons and was waived. It was the end of his regular season NFL career, although he did have tryouts with other teams. He was a player/coach with the Chicago Blitz of the USFL in 1984 but saw no regular season action. Overall, in six NFL seasons Shaw completed 52.9 percent of his passes for 6347 yards and 35 touchdowns while tossing 68 interceptions, with all but 61 passing yards and one interception occurring as a member of the Bills.